While the roller grill marks the end of the customer-facing production line, there's plenty going on a 180-degree turn away on the line sitting against the back wall of the front of the house. From the perspective of a team member working this line, it starts on the far left with a reach-in refrigerator holding backups of cold items. Next comes a worktable with a storage shelf below, followed by a double stack of fast-cooking ovens with two chambers each. Here, team members heat precooked pro- teins like burger patties, chicken breasts and other items. The chain recently tweaked these ovens, going to two units with two smaller cooking chambers each. According to Krebs, this has doubled the number of cooking chambers in roughly the same amount of vertical space. After the ovens comes a bank of two to four fryers, depending on the store's needs. These aren't conventional fryers. They're ventless, closed-top units, where team members don't even see hot oil. Instead, employees just drop food items in a bin, where they're deposited into the oil when the lid is closed. When the items finish cooking, the fryers dispense them into a basket. 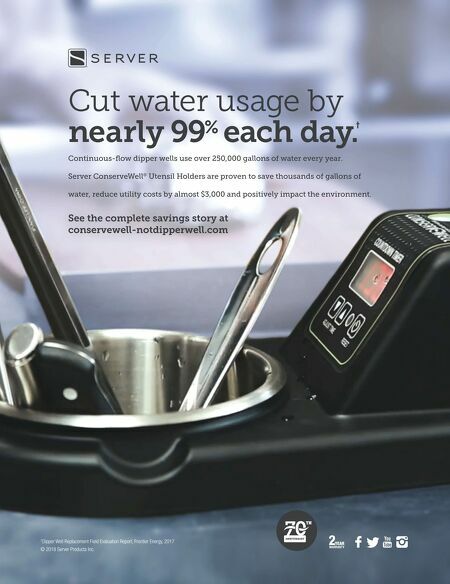 While ventless fryers don't produce the volume of traditional units, they're a good fit for the single-serve/small batch frying of a c-store, says Grandstaff. What's more, this setup is safer for employees and yields a more consistent product. In combination with a built-in hood system — not legally required but recommended by Grandstaff — it also keeps the building from smelling like fried food. A beverage station comes next, with preprogrammed equipment capable of making everything from cappuccinos to smoothies. New Prep, New Growth Rutter's newest store also has a new back-of-the-house area: a prep station. The area smooths out operations in the front of the house, where prep was previously performed. This station includes a new second oven setup for baking cookies, muffins and other goods, plus a worktable and refrigeration that holds staged ingredients. "To be able to portion all those items, then just have them brought up and heated simplifies things. [Team members] are not opening cans or bags up there in the service area. They load that fridge and freezer with whatever volumes they're going to need," says Krebs. While this prep kitchen has only been built in just one store so far, it will be the standard for new locations going forward, says Krebs. Given Rutter's plans to grow its store count by nearly 40 percent over the next four years, there will be many more units with this setup. These new stores, says Krebs, will be built in the com- pany's existing markets of Pennsylvania and West Virginia. Rutter's also plans to expand operations to Maryland as part of its growth push. That equals plenty of opportunity for the chain to figure out how to get the most out of the space — to continue to innovate with equipment and menus in order to offer guests an experience not typically found in a c-store. 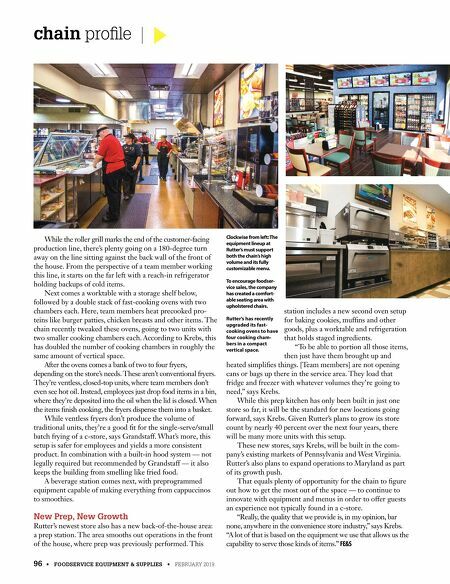 "Really, the quality that we provide is, in my opinion, bar none, anywhere in the convenience store industry," says Krebs. "A lot of that is based on the equipment we use that allows us the capability to serve those kinds of items." FE&S 96 • FOODSERVICE EQUIPMENT & SUPPLIES • FEBRUARY 2019 chain profile Clockwise from left: The equipment lineup at Rutter's must support both the chain's high volume and its fully customizable menu. To encourage foodser- vice sales, the company has created a comfort- able seating area with upholstered chairs. Rutter's has recently upgraded its fast- cooking ovens to have four cooking cham- bers in a compact vertical space.